Once again, my husband and I are going to be staying home for the spring and summer this year, rather than taking a long trip. We are expecting a couple of batches of family visitors during June and July, and will be taking a quick road trip in early July. 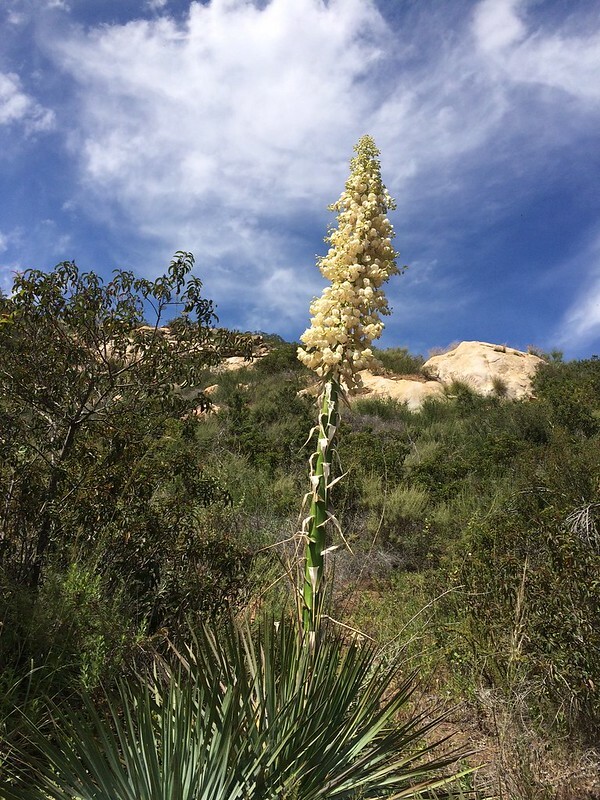 So today, the end of my spring break, I started to visit areas of San Diego County that I haven't been to in awhile. 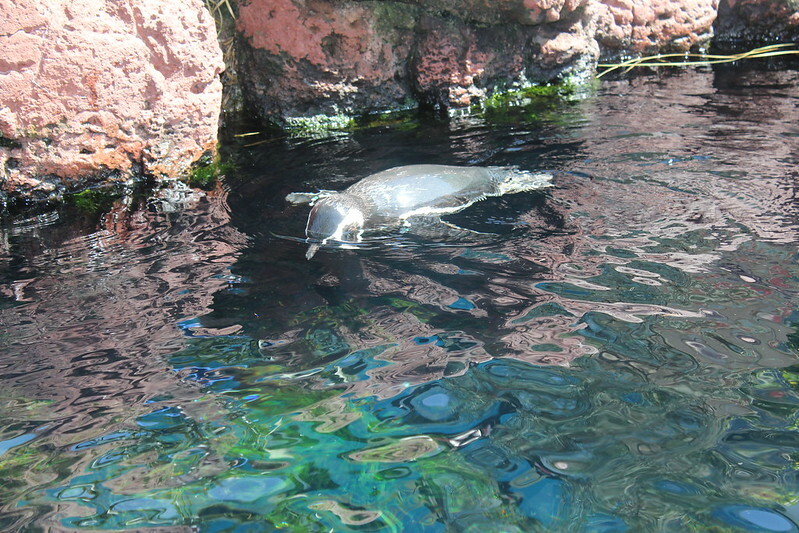 The trip today was to Sea World-San Diego. As a Southern California educator, I was eligible to get a free Fun Card for 2015. Since my daughter's family already had a Fun Card, she and I took the baby and went to Sea World for the day. 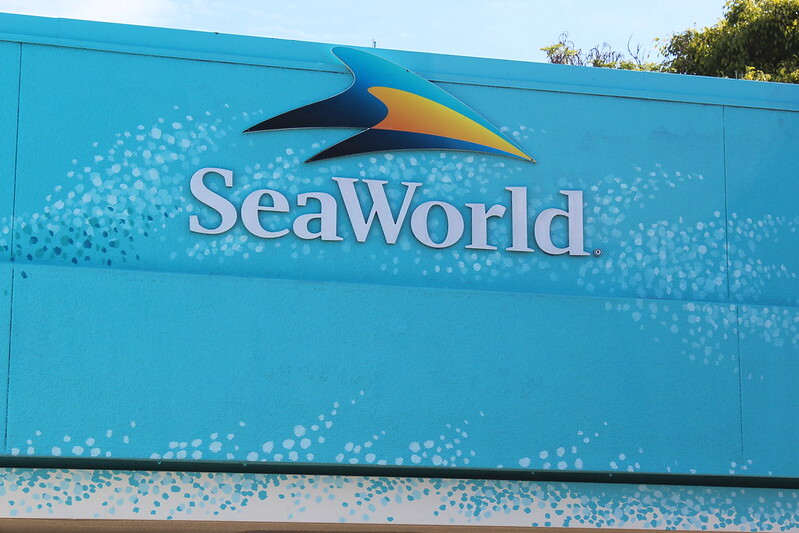 The last time I was at Sea World was almost 6 years ago, and it was then owned by Anheuser-Busch. They no longer own it, which may be a bit of a good thing. We were there by 10:00 am. Parking costs $16 unless your pass covers it (and hers did), and getting in early got us a decent parking place. Once up at the park entrance, I had to trade my voucher for the Fun Card. 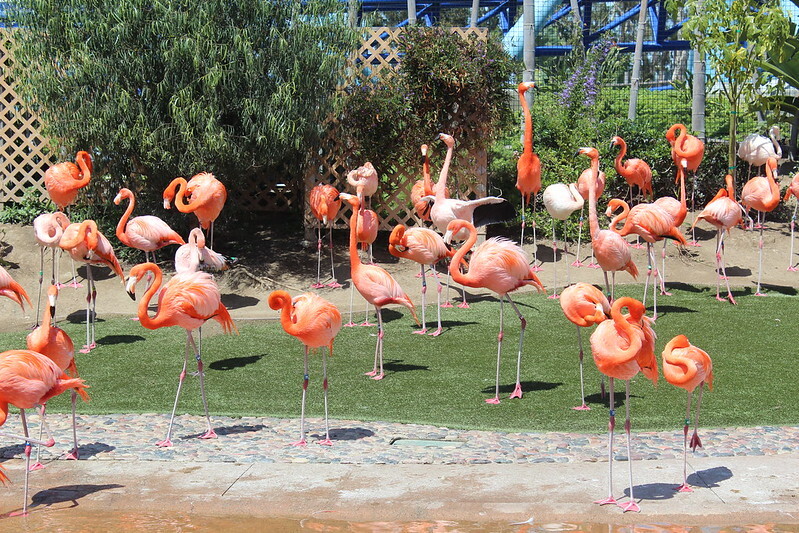 Sea World has a full section set up for kids to stretch their legs, play, yell, and holler either before, during, or after seeing the many shows and exhibits. My grandson enjoyed the kiddie rides, the bounce mat, and the climbing net before getting back into his stroller to go see some of the aquariums and the Penguin Encounter. 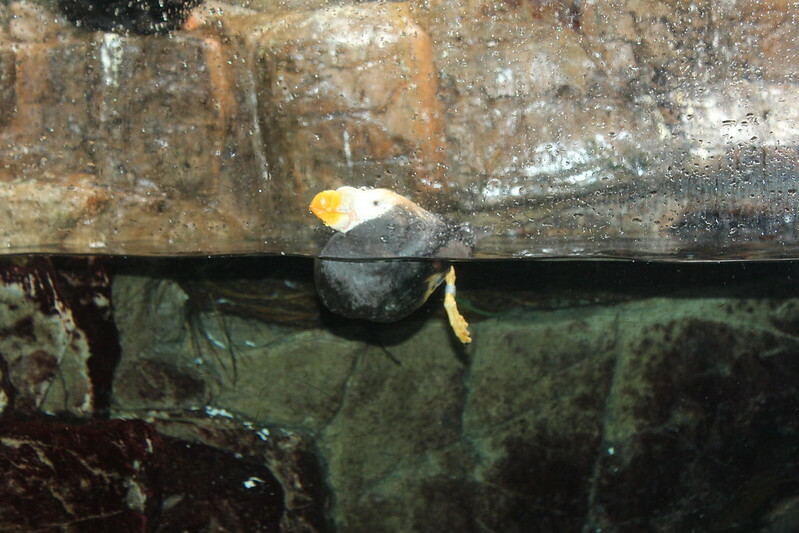 Once past the kiddie section, we headed for the arctic area which contains Wild Arctic and the Penguin Encounter. Outside of the Penguin Encounter were some Magellan penguins, who can tolerate the warmer temperatures that coastal San Diego can give. 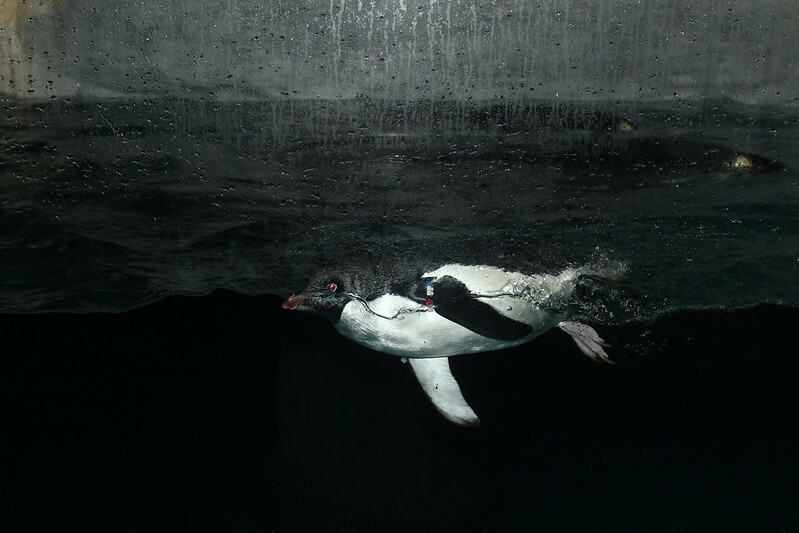 Inside the Penguin Encounter, one can view the Antarctic penguins, and the puffins (which are sort of a penguin that lives in the Arctic). It's hard to photograph these when the inside of the plexiglass windows are all steamed up! From there, we walked over to do the Wild Arctic. Due to my grandson, we couldn't do the simulation ride, but I've done it before and it's not all that great. 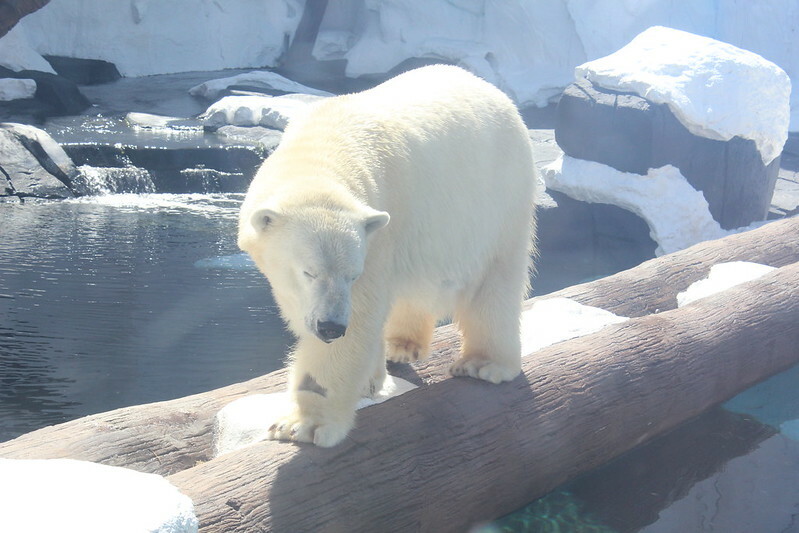 But the polar bears and beluga whales were out and in the mood to be photographed by all those people at the windows! 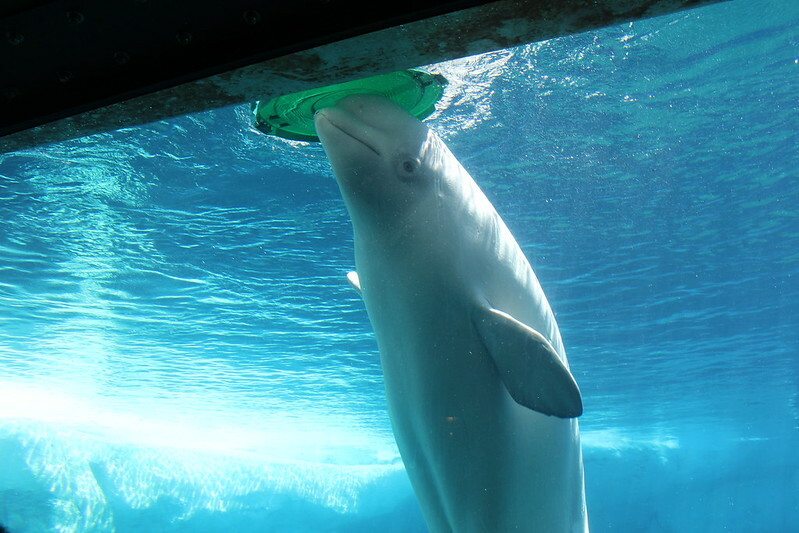 One beluga whale was also in the mood to play! We had lunch at the Caribbean Reef area. Food at Sea World is rather pricey. We had two pieces of BBQ chicken (a thigh-leg combo and a breast-wing combo), a load of French fries and a roll for $12.99, each. We shared with my grandson, and we each had our own water bottles with us because drinks are sky-high. 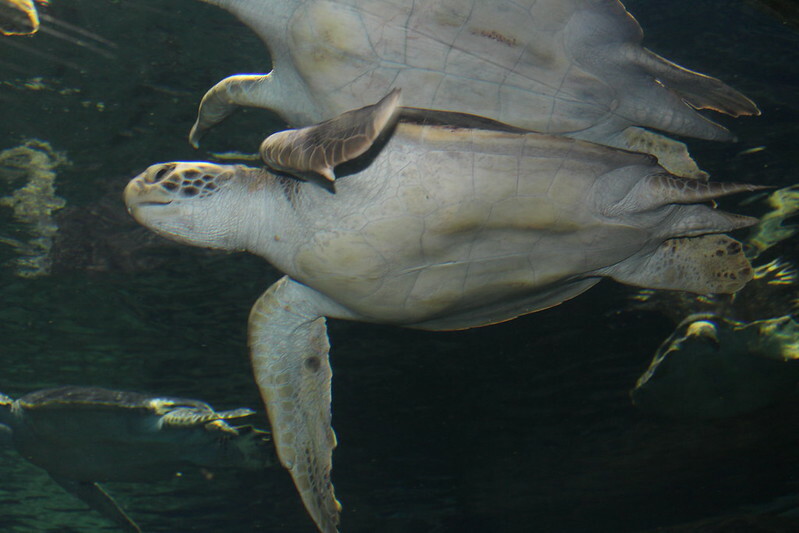 Next stop was at Turtle Reef. This was new to me, though my daughter had been inside it. This was a huge sea turtle. 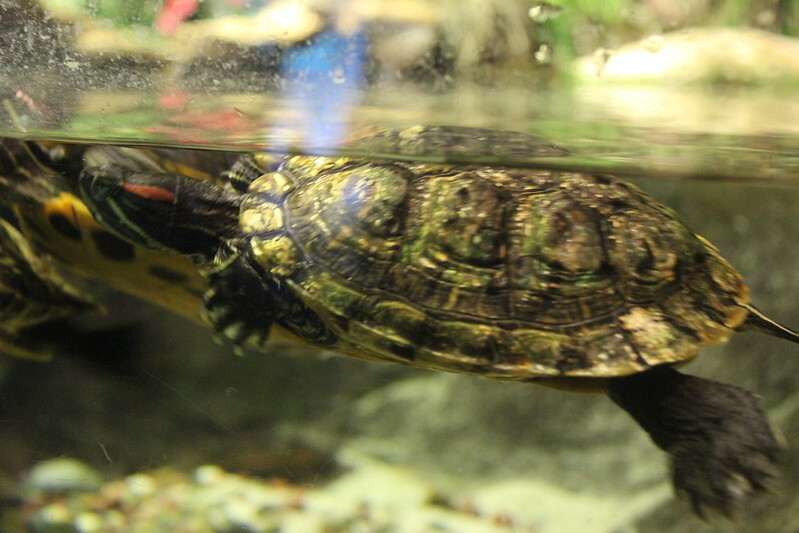 This was a much smaller turtle. 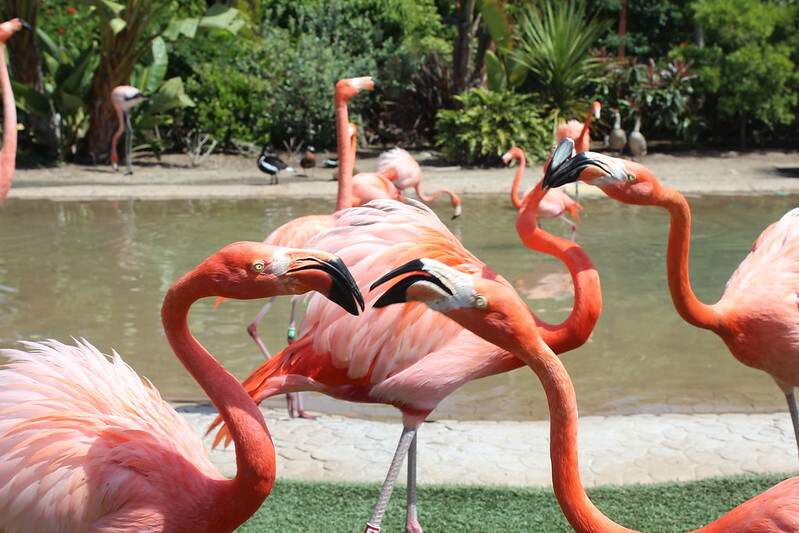 My mom taught me to appreciate flamingos. There were two different areas for them. 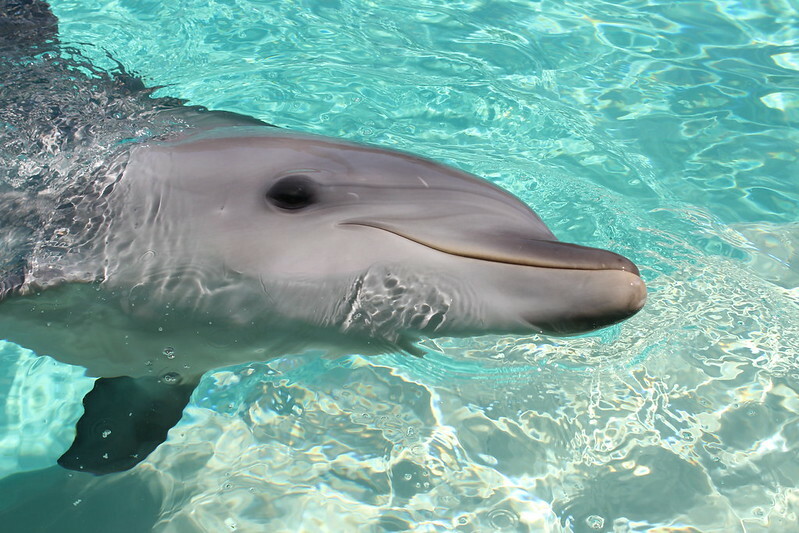 One was on the west side near to the Manta roller coaster ride (what's THAT doing at Sea World! ), and the other was on the east side near the old Clydesdale barn. The western area is evidently where they keep the nesting flamingos in the spring. 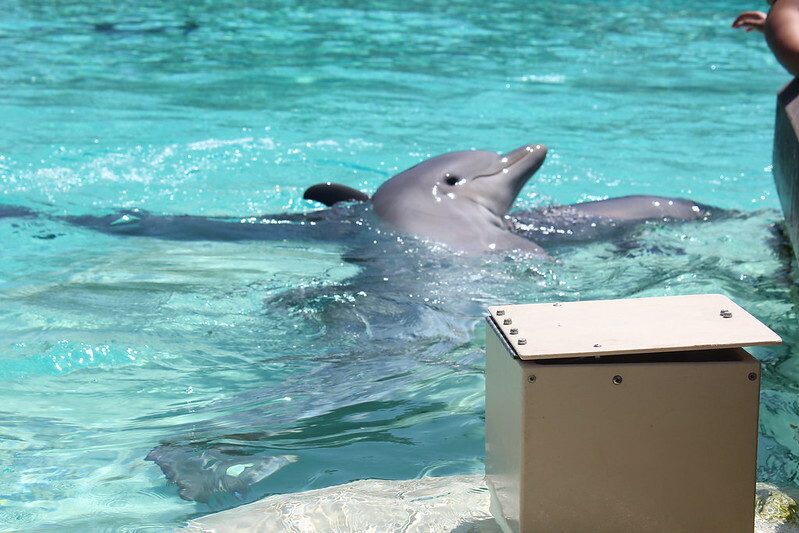 We stopped at the Dolphin pool for the longest time. My daughter has always loved dolphins, and she wanted to see if she could pet one. Besides, Baby Boy had finally dropped into a nap. Eventually we made it back to the other area of the park, and saw the eastern flamingos. These were the more social birds. There were two sets of them that had some sort of disagreement that made us all laugh. 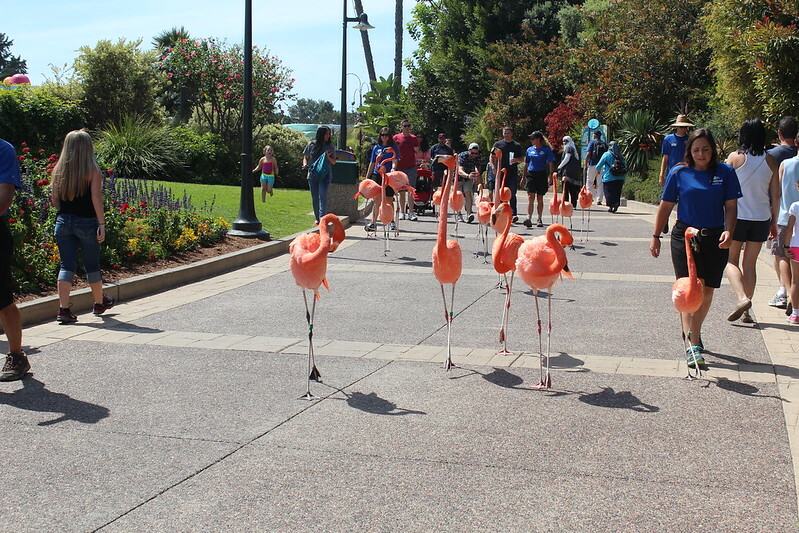 Instead of the Clydesdales on parade, which used to happen every afternoon when Anheuser-Busch owned the place, now the Flamingos from the east side go on parade. Alas, after 5 hours in the place, it was time to head home. We didn't want to fight rush hour traffic and we'd have been right in the middle of it if we waited another hour. We'd had a good time, the only money we spent was on our lunch, and I got a lot of sun and good walking. BTW, I wear a pedometer. 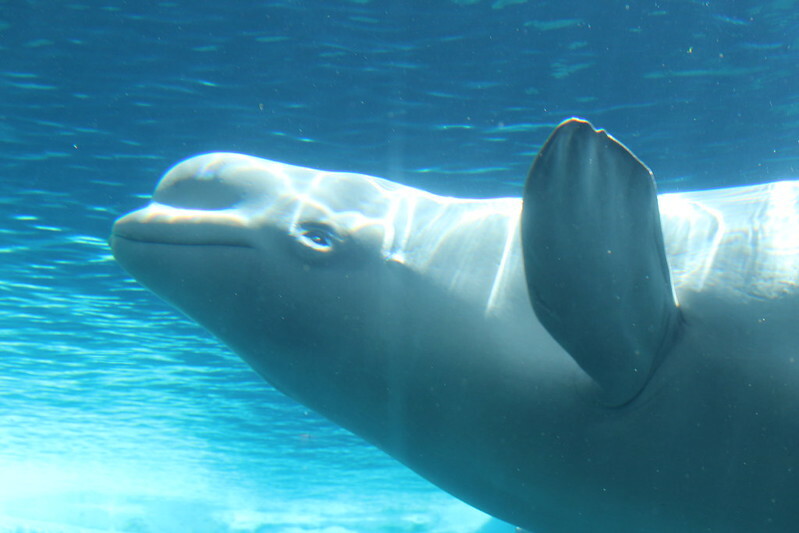 I walked for 3+ miles inside Sea World. Looks like you had a fantastic day Donna. Pity about the high food and drink price's. Ill remember to take my water if i get back over to your beautiful country. Love the pictures. Keith, great idea to bring your own water... they're in an unbelievable drought in CA. Just have to be able to get it through security. I guess ill have to force myself to drink soft drink. :) Yes, terrible that. I did read that there are nice green golf course's out in the middle of no where in California. Hopefully thats not true. Drinks at Sea World - if you just ordered a regular sized drink with lunch, it would cost about $3.60. They also offer a "souvenir cup", about 24 oz., for $14! Of course, the day you buy it, you can get that cup refilled as many times as you want, for free. Then, you can get it refilled for 99c on subsequent visits during that season only. Daughter did that with her souvenir cup, before we left. There are drinking fountains all over the place, for refilling water bottles. They don't keep you from bringing in your own food or drinks, but woe to you if some of the thieving sea gulls snitch your sandwich. As far as green golf courses -- many of the golf courses have let their courses get a little brown these days. Others have a way of recycling the water and are able to keep reusing the same. Sea World has water play areas for kids that use recycled water...my grandson does not like those because the water comes up unpredictably. My husband and I are trying to get back into the habit of walking every day, but walking the neighborhoods gets old after awhile. 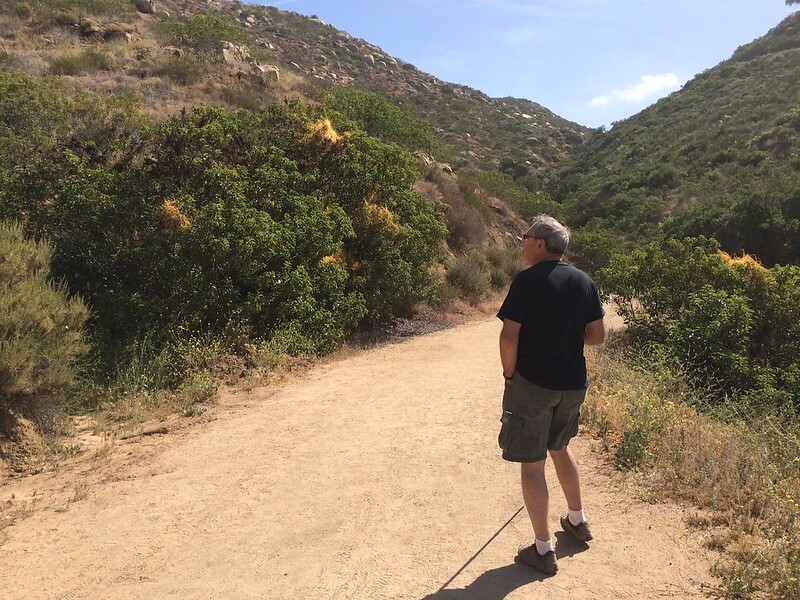 I finally convinced him to give some of our urban dirt trails a try, so we headed for Poway's Blue Sky Ecological Reserve, and its trail system. 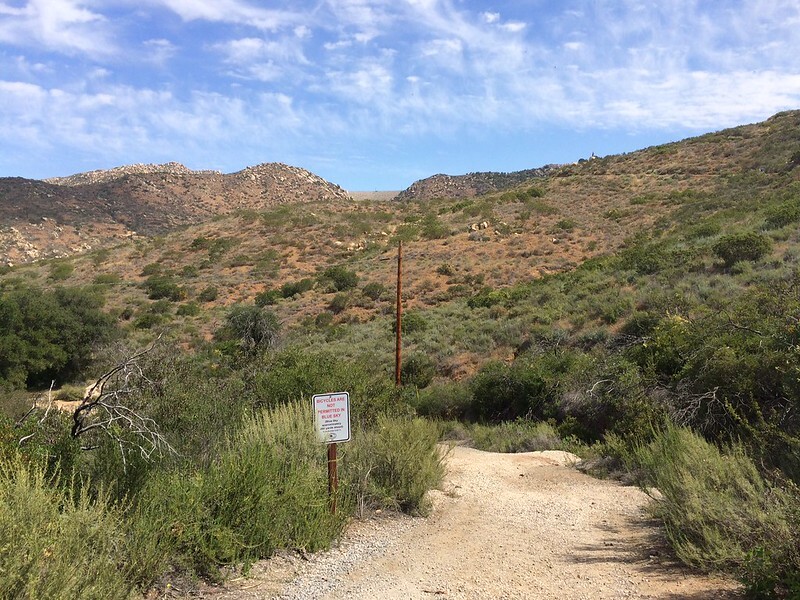 The trails range from old dirt roads (still usable by the ranger trucks, but not by the public) to regular single-wide dirt paths. We headed down and took a left when we saw the Creekside Trail. 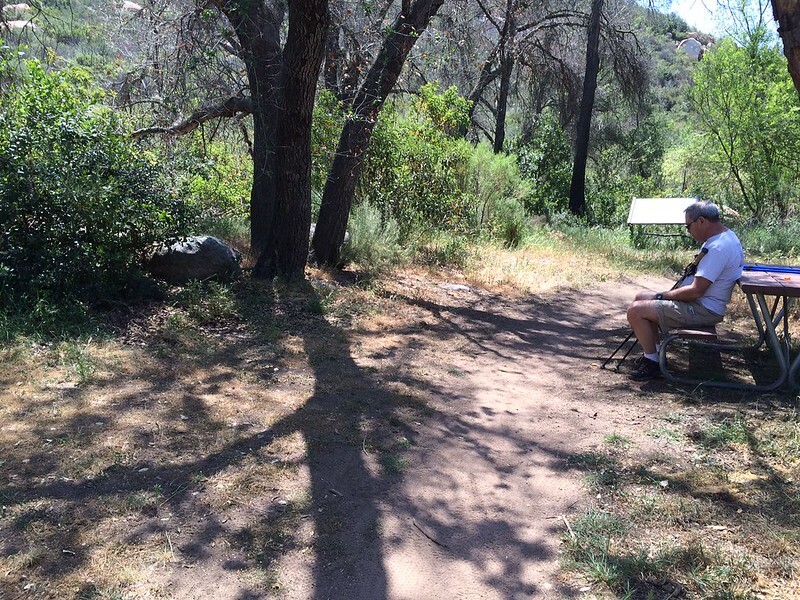 It was a quiet dirt path, just above a very-dry creek bed. Yes, we are in a severe drought. I doubt that this creek has seen water in several years. Evidence of the 2003 Cedar fire shown in tree bark, even 11+ years after-the-fact. After walking along the Creekside trail, we continued up the dirt road and made a decision at the Fork in the Road. 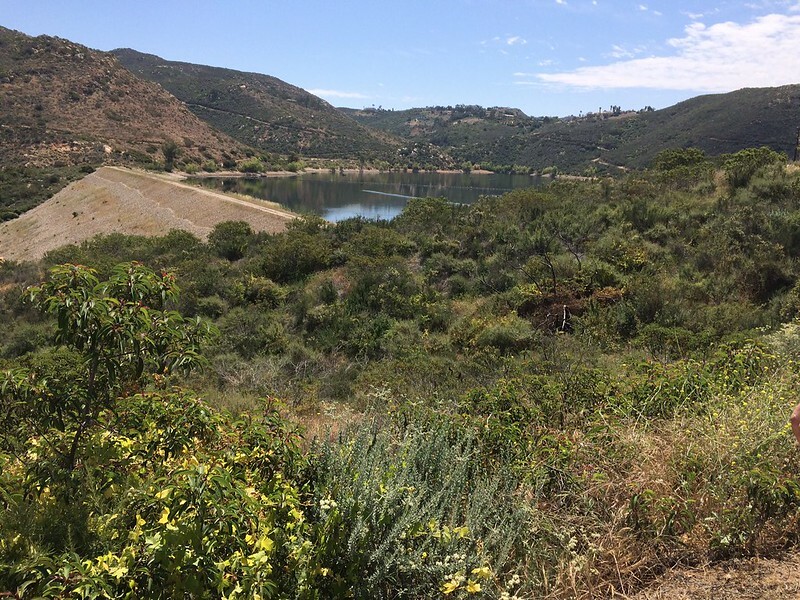 We could go right towards Lake Poway, or keep going straight toward Lake Ramona. We decided to go a little ways up the Lake Poway trail. Then we kept on going, and going, and going, making a right at one point to get ourselves up to the viewpoint where we could actually see Lake Poway. Just before that right turn was a very quiet picnic area. 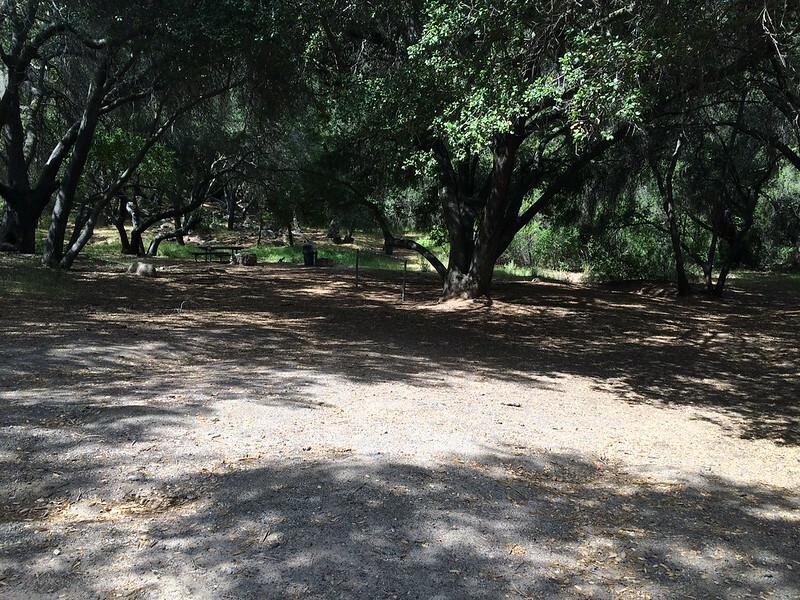 It used to be a tent-campers, walk-in campground, but after the Cedar fire, overnights were no longer allowed in the area. Halfway up to Lake Poway, I had to stop and take a breath. So I looked back and saw this awesome view. 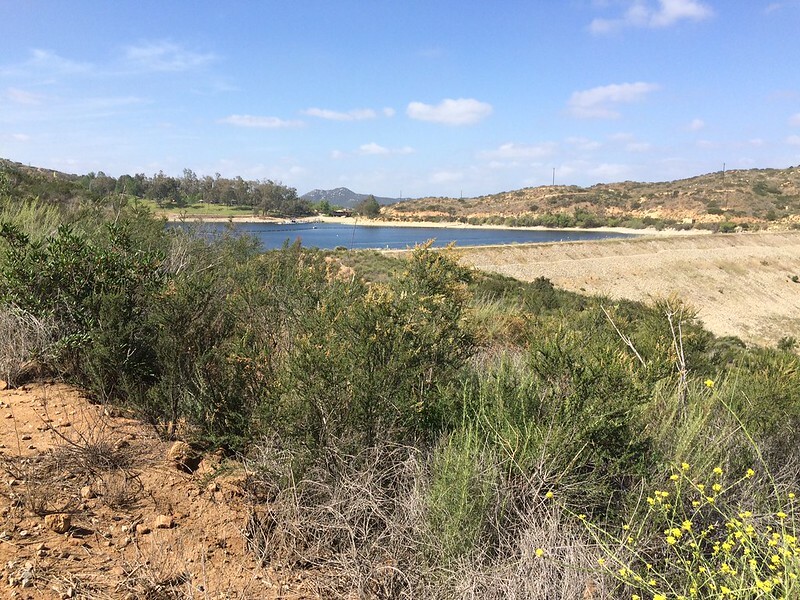 If you look carefully, you'll see the small earthen dam that holds back Lake Ramona. Alas! 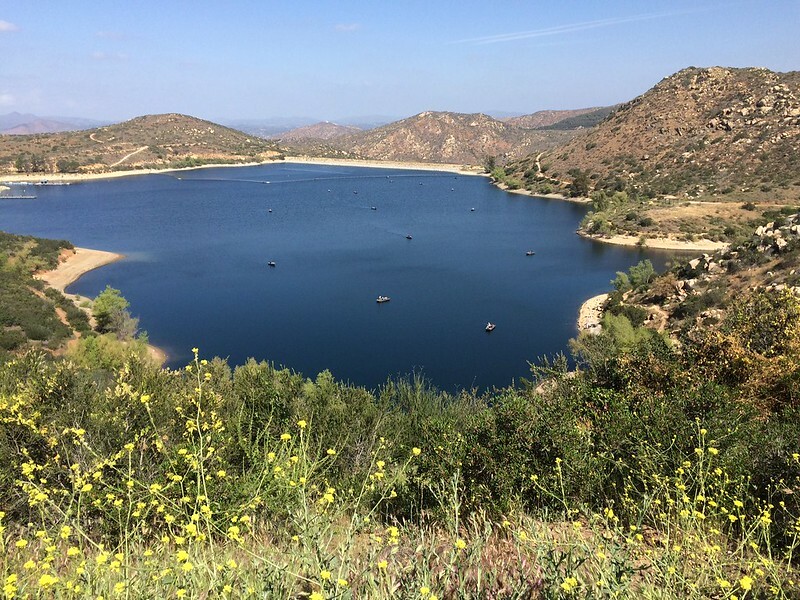 Lake Poway! We didn't venture in any further. 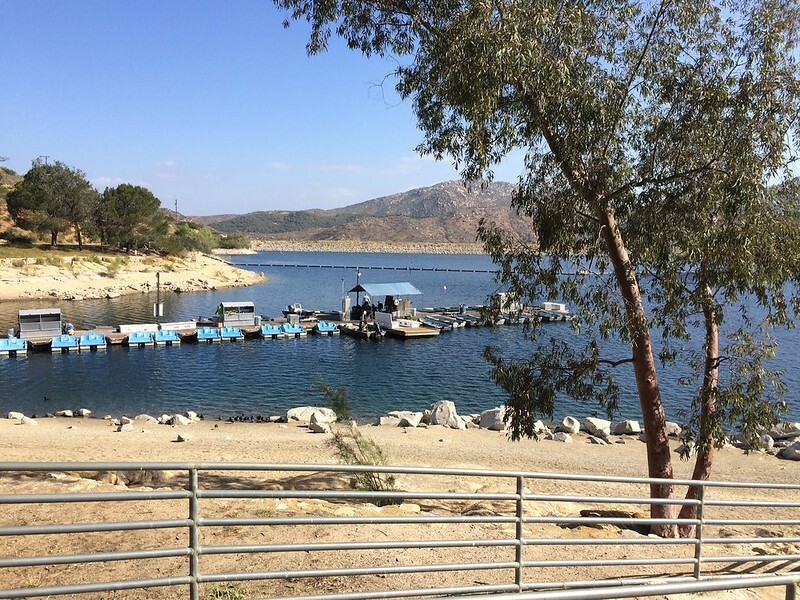 Lake Poway will be another day trip sometime. That ended our beautiful morning in the Blue Sky Reserve. I didnt think that would be right what i had read about the golf course's. Thanks for that. Part I of Stay-Cation 2015, Day 3: We chose to spend this beautiful Easter Sunday out in God's beautiful nature, taking in the fresh air and strengthening our bodies. 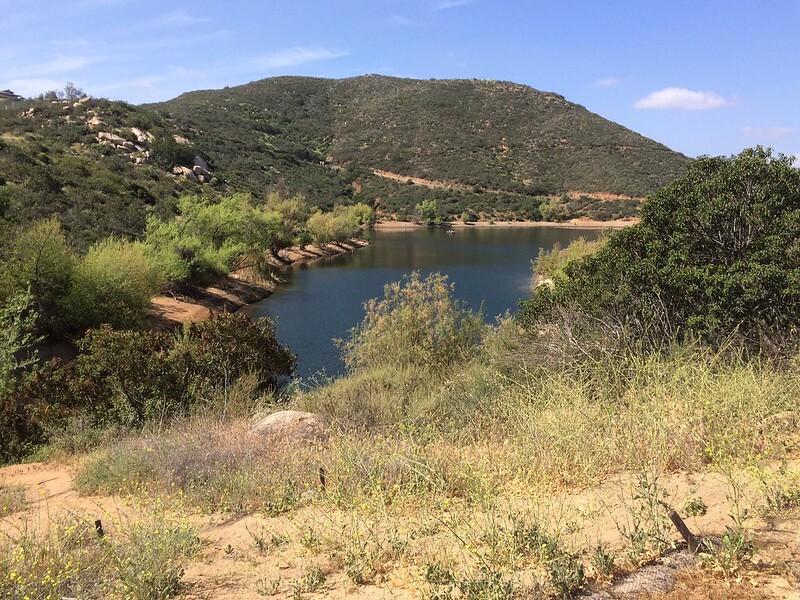 Our day trip was to Lake Poway. I had not been there in many years, so it was high time for a trip. It's a place for families to enjoy a picnic, barbecue (grills only, no open fires), play volleyball or softball, let the kids roll on the grassy hills and play on the playground, do some fishing either from the shore or a small motorized boat, or hike. Being a gorgeous day, we saw a lot of families doing all of that, some still setting up. (If they got there much later, parking was going to be by shuttle bus only.) For locals, it's free, but non-residents pay $5 car to park for the day. 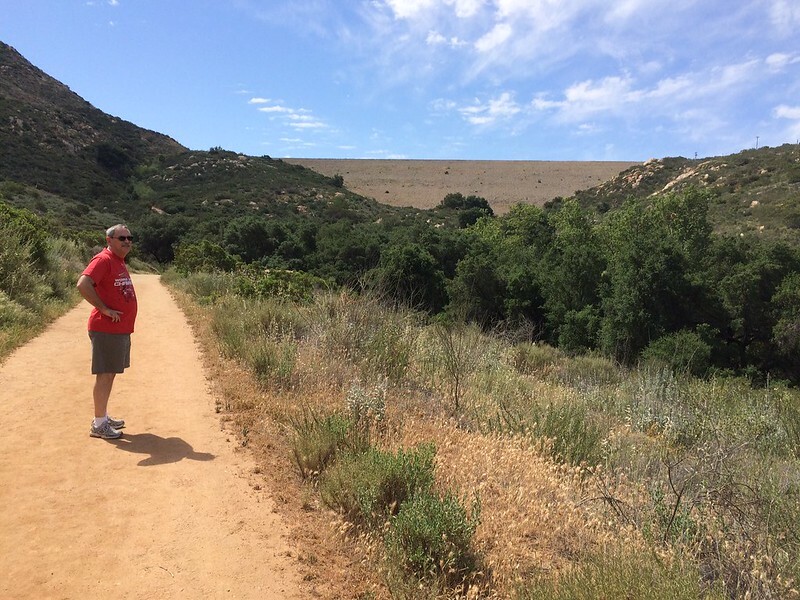 We had to repeat that downhill section, then slog up the mountain on the other side of the earthen dam that holds back Lake Poway. But the views were really beautiful! 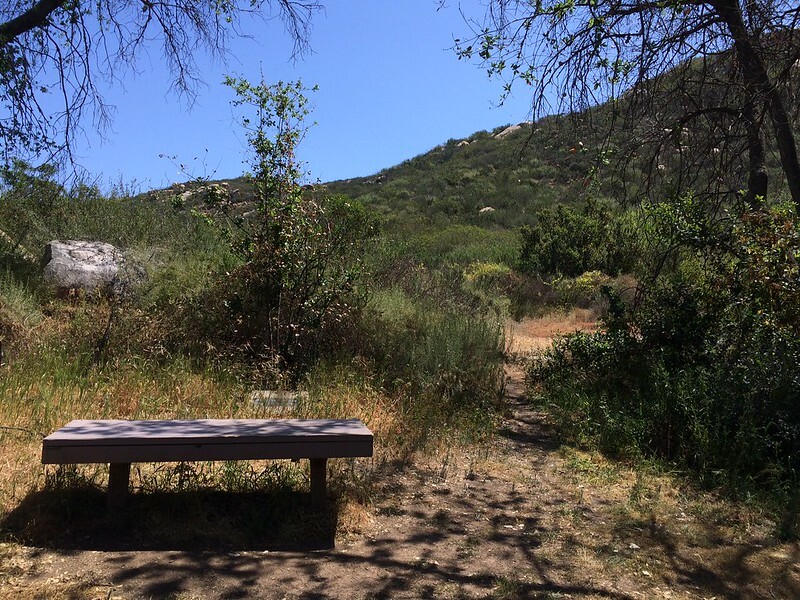 The adage we speak of about national and state parks holds true at Lake Poway: There can be a LOT of people at the main road, but the farther you get away from the main road, the less people you run into. Our only complaint (yesterday and today both) were the ones that insist on having a loud conversation when you are trying to enjoy the sounds of birds singing. At one point, we let some of those noisier groups go by us. Here's a photo of my husband looking up at a different trail. Yes, we've gained walking sticks since yesterday! The far end of this photo, off in the distance, shows the earthen dam. 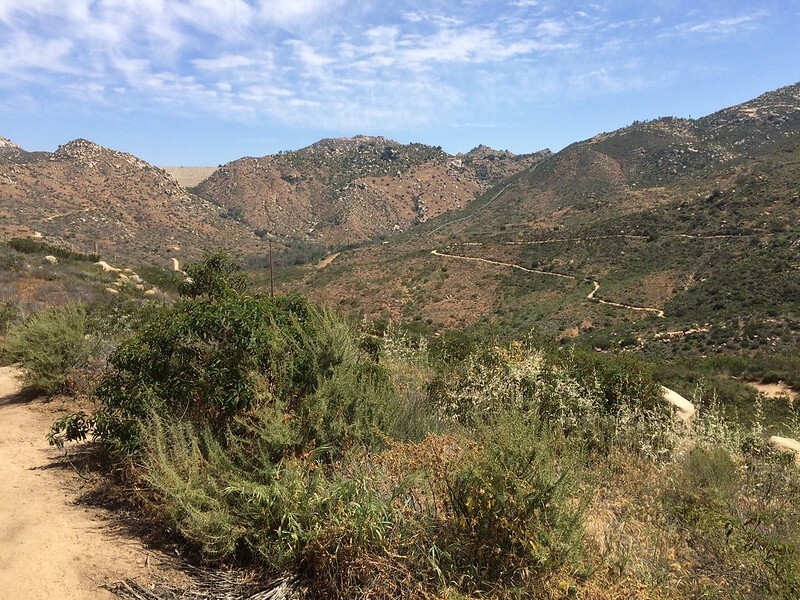 By this time, the trail had pretty well leveled off, and there were more people on it, too. Too bad, but we had to remember that it IS Sunday! By this time, all the lots were jammed, and folks were driving around in hopes that someone (like us) would leave a parking place for them. My recommendation for any city park on a weekend in the spring, summer or fall: go early in the morning (by 9 am). It's the same attitude we hold toward national parks and monuments, too. It was time to head home and let all the picnickers enjoy themselves with a day at the Park. 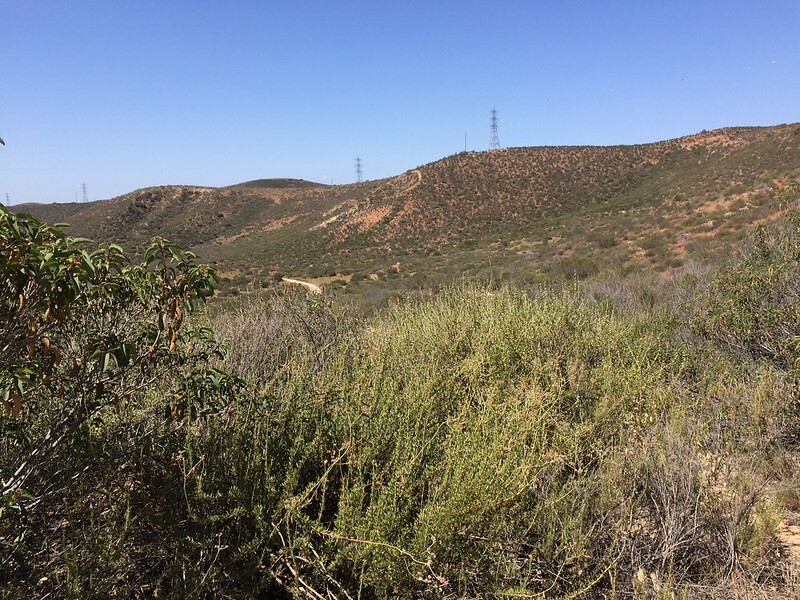 San Diego County is full of "Open Space Preserves", to try to keep urban sprawl from going everywhere and saving some of nature for recreation and renewal. 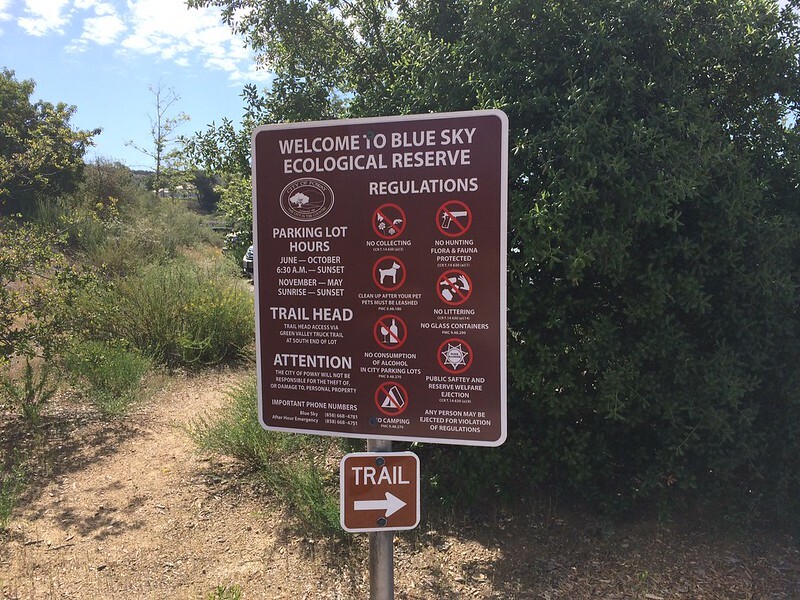 Blue Sky Reserve is one of them, the Goodan Ranch-Sycamore Canyon Preserve is another one. We set out to explore this one today. There are two approaches to the Preserve. One is off of CA-67 (known to the locals as just "the 67"), the other is the back road in from Poway, a lesser-known and used approach. That's the one we used. It's also the only one open 7 days a week. 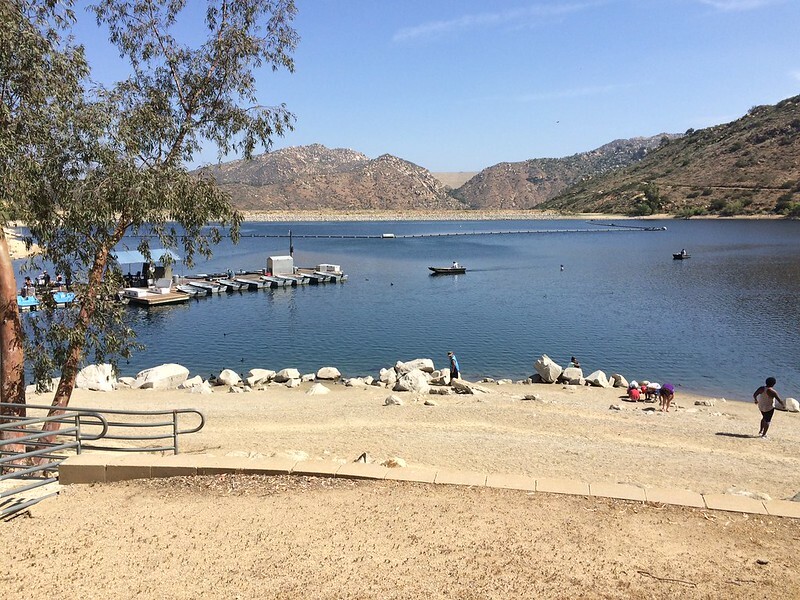 The staging area off the 67 is open only on Saturdays and Sundays. Our feet sported pairs of new hiking shoes today. We'd been hiking in our everyday walking shoes, which really aren't made for trails. I grabbed my 30-yo hiking boots only to have the rubber sole disintegrate on me, so it was time for new ones. We also bought a second pair of hiking poles. Considering the type of trail today, we appreciated having two each (instead of 1). 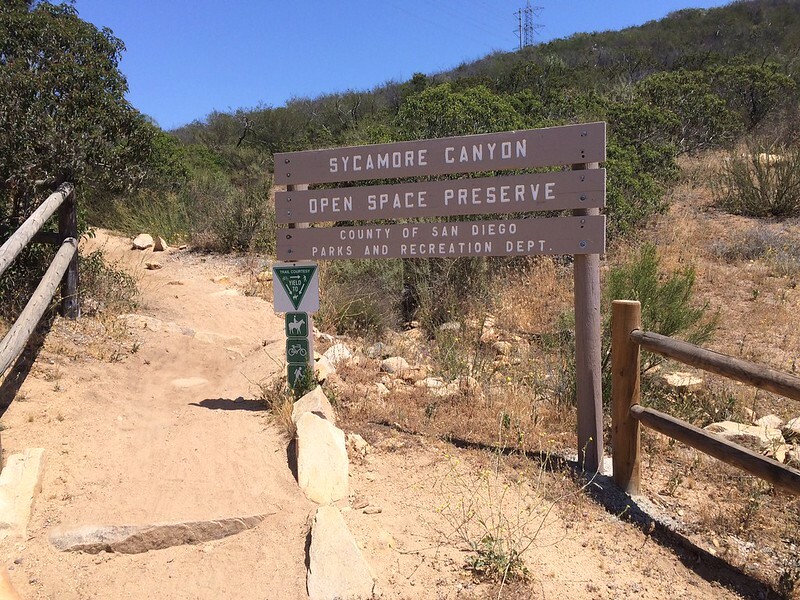 By accident, we headed downhill on the Sycamore Canyon truck trail, but we knew we were going to do a loop anyway and probably really didn't matter which way we went. It was somewhat disappointing to be walking on a little-used road, but no matter. About 0.7 of a mile, we turned down another road, and were only on that for another 0.3 before turning off on an actual trail: the Martha's Grove Trail. 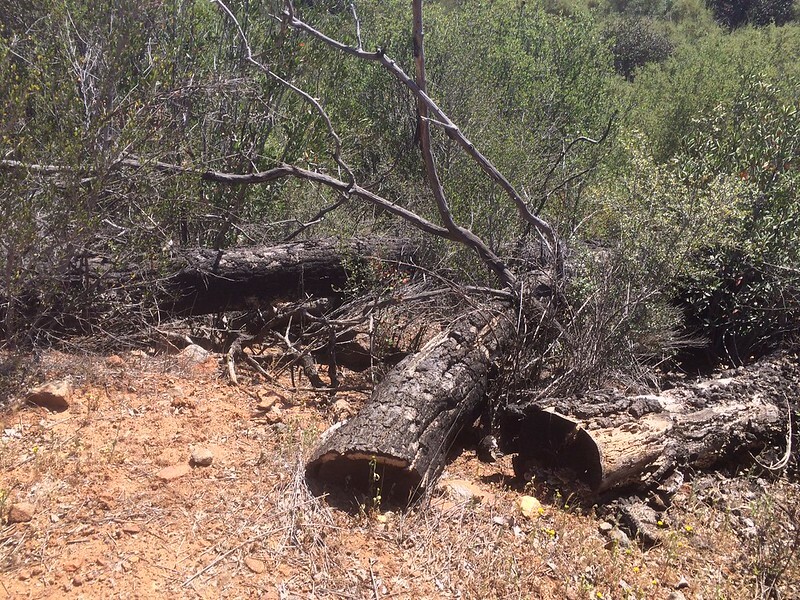 This was another area that had been hard-hit by the 2003 Cedar fire. I was relieved to see the growth, but you could always see remnants of the damage that the fire did. 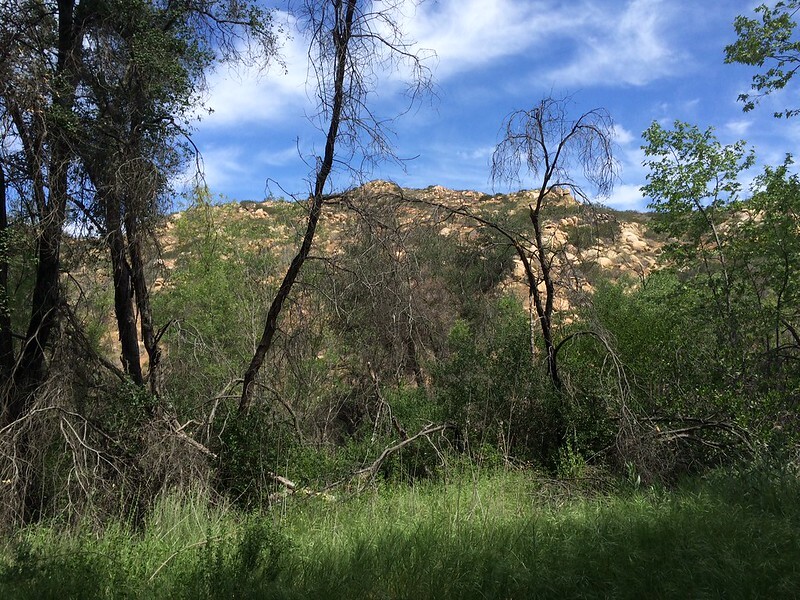 We followed the very-dry stream bed for a long while, listening to the birds chatter. 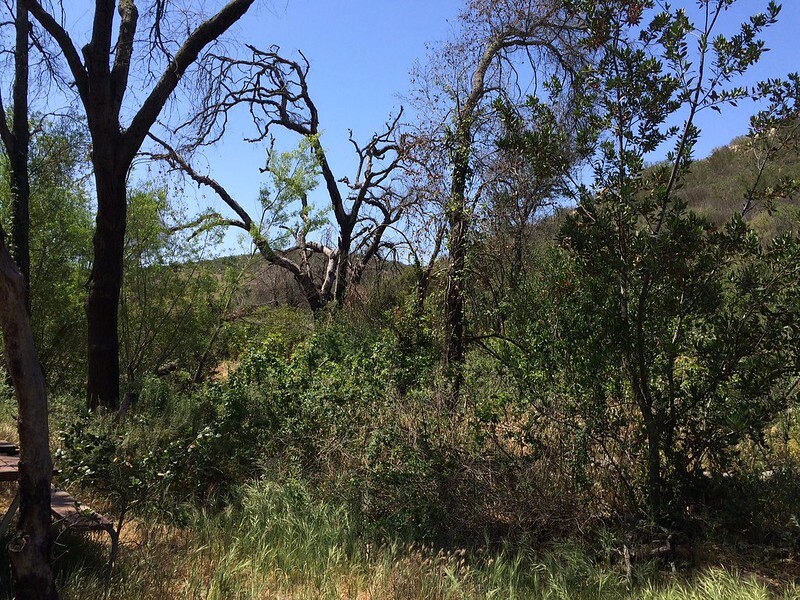 In far wetter years, this particular grove is full of poison oak, ticks and other issues. Alas, we found the trailhead, and decided to do two things: take ourselves to lunch at In-and-Out, and then go to Kohl's and find some decent socks for our new hiking shoes. Tomorrow? 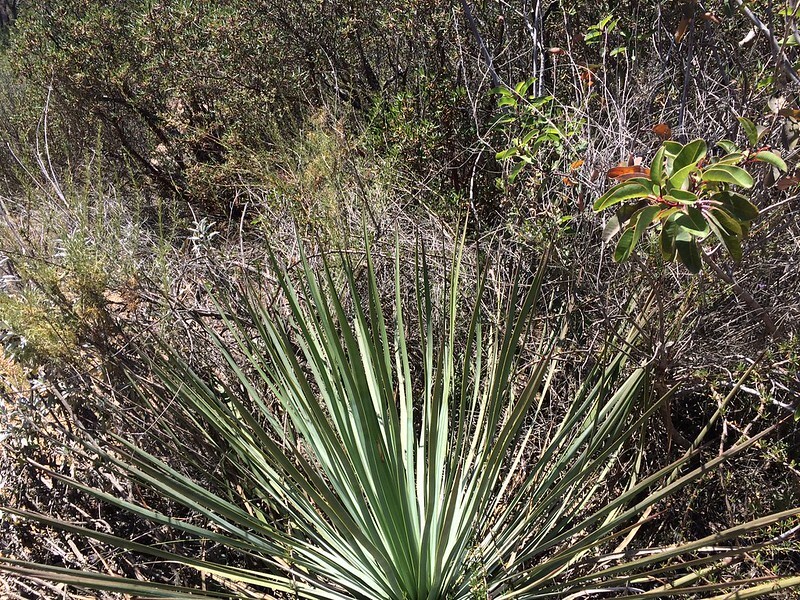 We haven't decided, but it will be some yet-undiscovered (to us) part of San Diego County!